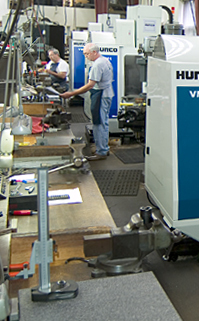 Mechanical Specialties Company has been providing prototype machining services since it’s inception in 1957. Since then we have grown to provide custom and prototype parts to a variety of industries including Spinal Implant and Orthopedic Tooling, Commercial, Aerospace, Defense and Remote Visual Inspection. While our services are geared towards the high demands of these industries, our machining solutions can be applied to any need that demands high quality, tight tolerance machining. Our Prototype machining philosophy is simple: we work directly with our clients provided engineered drawings to produce the most accurate, crafted prototype or custom part to solve our client’s need, efficiently and quickly. Our attention to detail and quality sets us apart from the competition. We are confident that our commitment to excellence and ability to provide our clients with real-world solutions can be the key to your next successful Prototype Machining project.